Pongal recipes! 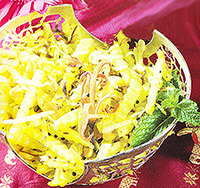 Delicious food for Pongal. 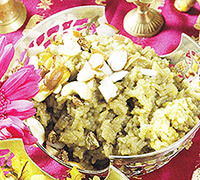 The best of South Indian dishes are savoured during the harvest festival of Pongal. 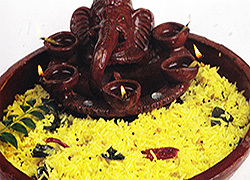 So enhance the mood of Pongal further by preparing sumptuous dishes back home. Here are some of the famous selected Pongal Recipes. Try these popular recipes with love and share the dish with your family and friends and have a blast this Pongal. Wash rice. Take a large pan then boil 6 cups water with 1 tsp salt, then add rice. Cook it till just done.do not overcook. Strain the rice in a big metal strainer. Spread on a tray and run a fork to separate grains. Let it cool. Add lemon juice, turmeric powder, salt and sugar. Take a kadhai and put oil then heat it. Add mustard seeds, dal and red chillies. Cook it on very low heat till dal just starts changing colour. Add curry leaves, the lemon juice mixture, 1/4 cup water. Cover it.Cook it on low heat till dal turns soft and the water dries. Then add cooked rice and mix it very carefully. Stir it for 2-3 min. Don't forget to check salt and serve hot. Take a kadhai, put rice and dal, then dry roast for 4-5 min on medium heat. Remove it from kadhai. Put it in a pressure cooker then add the milk and water. First pressure cook to allow 3 whistles then reduce heat and keep on low heat for 1-2 min. Remove it and let the pressure drop by itself. Again take a kadhai add the jaggery with 1 and half cups water. Cook it for 5-7 min till get a nice golden coloured syrup then keep aside. Open the cooker and add add the jaggery syrup to the rice-dal. Mix it very well and stir on low heat for 5 min. Then remove from heat. Take clean vessel, put on ghee and heat it then add the chopped nuts. Fry it on medium heat till they change colour. Then add the cooked pongal (rice-dal) and crushed cardamoms. Mix it very well. Take a frying pan and pour 4 cups of water. Then add 1/2 tsp salt and the potatoes strips,boil it for 5 min till tender but firm. Take a non stick frying pan, heat oil and add cumin seeds, mustard seeds and the peanuts then stir it on medium heat till light golden. After that add golden chilli and curry leaves. Then add the potatoes and stir it till it is well coated in oil. Cook it dry for 1-2 min. Add salt, turmeric and grated coconut then mix it very well. Then cook it for 5-7 min on medium heat. Starring all the time. Remove from heat and sprinkle lemon juice. Serve hot. Rinse the above ingredients in water for about 2-3 hours.Then grind in a blender (with adding water in steps) into a very fine flour. Add salt and keep it aside (to get sour) for 12 hours. Heat the pan and spread a drop of oil on it. When the pan is fully heated, take some flour and spread it on the pan into a round shape. Turn it over so that both sides are cooked well. When it is almost cooked spread a teaspoon of coconut chutney over it. Place some potato curry and roll the dosai on both sides and move it to a plate. Cut carrots and tomatoes and boil for a few minutes till the raw smell disappears. Grate it to a fine paste in the blender. Cut onions and capsicum into fine pieces and fry them in a little oil till the onion turns golden brown. Add the tomato-carrot paste to this. Add 1 tsp chilli powder, 1 tsp garam masala powder, salt to taste. Pour some water in the mixture so that the gravy is not too thick. When the gravy begins to boil, add the boiled rajma and simmer for a few minutes till the rajma mixes well with the gravy. Soak the almonds for an hour. Drain. Remove the skin and grind into a thick smooth paste adding minimum water. In a thick vessel, mix sugar and 1/4 cup water and heat. When the sugar is completely melted, add this paste and cook this for five minutes. Add ghee and remove from fire. Pour it on a large palate and smoothen the surface of the mixture with a roller. Then cut with a knife by drawing parallel lines in the form of cubes. 1/4 cup of raw Rice. Heat one litre of milk and when it boils and starts to rise add raw rice. Keep in low heat with constant stirring until the quantity reduces to one-half. Add sugar and powdered cardamom. Roast cashew nuts and raisins in ghee and add it to the payasam. Chopped almonds(combined) - 4 tsp. Allow the milk and coconut extract to boil, add the soaked rice and cook. After it is cooked, add sugar, cardamom powder and almonds and let it boil for 5 minutes. Add the evaporated milk and let it boil.